We're very pleased to announce that we have appointed social entrepreneur, author and mobile technologist Ken Banks as Head of Social Impact. Ken has over 30 years of experience in developing technologies for social good and will use his industry knowledge and experience to progress our social impact. As one of the UK’s founding B Corps, we are certified to meet rigorous standards of social and environmental performance, accountability, and transparency. We're investing to make a social impact, as well as achieve financial and commercial success. Globally there are still billions of people denied access to essential services because they don’t have a way of proving who they are. These challenges become more acute in the developing world when the lives of families may depend on it. Ken’s expertise and connections will help us to accelerate our social impact, ensuring we work with organisations and non-profits wanting to leverage digital identities to improve commercial and public services, and empower individuals. We now have over 200 employees and Ken is a fantastic addition to the team. 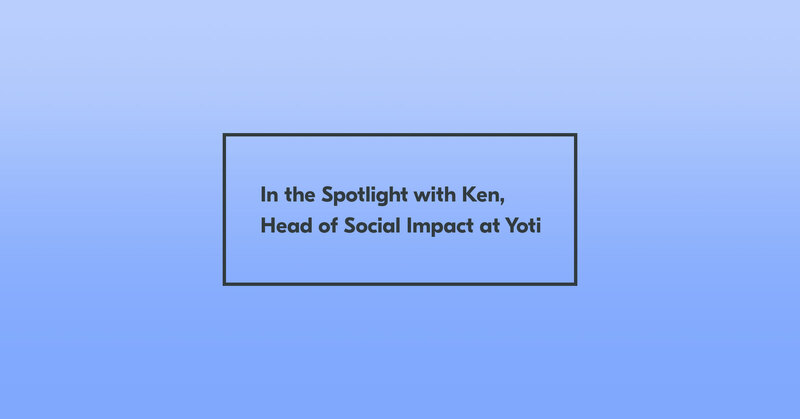 We caught up with Ken to chat about his previous experience and what his new role at Yoti will involve. You’ll be heading up our social impact work here at Yoti. Tell us a little bit about your background and how you got into this line of work. I have something of a mixed background, initially joining the world of offshore finance in Jersey, where I was born. I’d also taught myself to code by this time, and had been making money on the side writing teaching programs for a local education centre. Jersey was a wonderful place to grow up, but I was always aware that much of the world wasn’t like this, and in 1985 the Live Aid event (which raised funds for the Ethiopian famine) stirred my interest significantly. I started reading international development books, took a strong interest in global conservation efforts, and started taking time off work to travel to Africa to take part in work projects. I never looked back, and eventually left Jersey in 1996 to study at university in the UK. Over the past thirty years I’ve lived and worked across the African continent, helping with school and hospital building, carrying out technology research, working on biodiversity initiatives and running primate sanctuaries. As a result of this extensive field experience, in 2005 I developed a platform called FrontlineSMS which was aimed at non-profits in the developing world, allowing them to run and manage mass text messaging programs from anywhere. Today, FrontlineSMS is being used in over 190 countries around the world serving tens of millions of people, and over the years it has been recognised internationally with many awards, including one from National Geographic. More recently, as part of my efforts to help others use technology in meaningful, appropriate ways, I published two books on social innovation and over the years I’ve spoken about conservation, development, entrepreneurship and technology at events and conferences around the world. I feel very fortunate to do something that I love. You can read more about everything I’ve done on my personal website at www.kiwanja.net. When did you first hear about Yoti? Because of my extensive work in technology and global development, I was approached by Yoti in 2015 as they began pulling together the beginnings of their Guardian Council, and I served in that role up until joining full time as Head of Social Impact in April 2018. Yoti Guardians are influential individuals who ensure that Yoti always seeks to do the right thing, and that they are transparent about what we are doing and why. It has been a fascinating two-and-a-half years watching Yoti grow, and helping it grapple with many challenging (and, today, very topical) issues around user privacy and security. I have also used my own focus of simple, appropriate technology to help Yoti think about those that it excludes, as much as it includes, when it makes technology choices. This is a first for Yoti, having a Guardian move into a full-time role, although we do have the benefit of knowing one another intimately after more than two years together. What will you be doing as Head of Social Impact? I’m excited to begin the next chapter in my journey as I take on this amazing role at Yoti. I – and many others – believe Yoti have developed a digital identity solution with enormous global development and social impact potential, and I’ll be working to make sure we make the very best of the opportunity. I intend to leverage my many contacts in the international conservation and development sectors, and the social innovation world, to ensure we speak the right language to these communities, and that we provide them with the resources and answers they need to solve and manage their own digital identity needs. Globally there are still billions of people denied access to essential services because they don’t have any way of proving who they are. These challenges become more acute in the developing world when the lives of you and your family may depend on it. These are exciting times in the world of digital identity, and exciting times to be at a place like Yoti. If you’d like to talk more about identity and global development issues, please get in touch - I’d love to hear from you!